The saga of the Hermes’ residence 5/34 Wurlitzer began in February 1956, when a young insurance agent from Racine, Wisconsin by the name of Fred Hermes (then 29 years old) bought Detroit’s Michigan Theatre organ for $1,000. The "catch" was that it had to be removed from the theatre in one week's time. The console had been encased in a concrete block room with a small opening, so Fred, along with three helpers, had to dismantle the console and remove it piece by piece. The four men worked 18-hour days, and within the week, the entire organ was out of the theatre. It filled two large moving vans, and as usual, the last item left to be loaded was the blower. With space at a premium, the blower made the trip back to Racine on the unfolded lift gate of one of the trucks! The Michigan Theatre was later converted into a parking garage with plaster and parts of the proscenium arch still visible to drivers today. 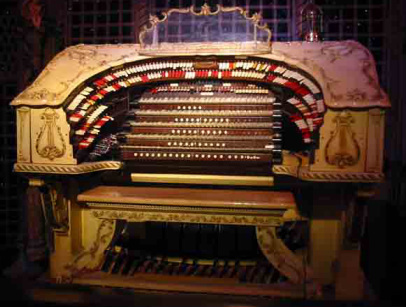 The original 28-rank organ was the largest of three five-manual instruments built by the Wurlitzer firm. The other two such instruments were installed in Chicago mere blocks apart at the Paradise and Marboro Theatres, and were each 21 ranks. The "Basement Bijou", as it has become known, is the lower level of the Hermes home. It is equipped as a 1920's movie palace would have been, complete with seats, chandeliers, plaster work, projectors, and other artifacts from closed theatres around the Midwest. There is even a Brenograph available for showing slides and creating spellbinding lighting effects on the screen! Six rooms were built to house the organ – four as pipe chambers (just as it was originally) and two as equipment rooms to house the massive relay, blower, and the organ's tremulants. To this day, it is still playing on its original electro-pneumatic relay, with the original wiring to the chambers and chests, and the original cable to the console. The main seating room of the theatre is 30x60 feet and is 17 ½ feet high. The living area of the home is located at ground level above the theatre. It took four years to recondition and reassemble the organ in its new home, and after it was installed, Fred dug a pit (by hand) under the console and installed an original Peter Clark lift so the massive Wurlitzer console could again rise to the sounds of an opening overture, just as it once did in the Michigan Theatre.